Rain Garden- an excavated shallow surface depression planted with specially selected native vegetation to treat and capture runoff. Rain gardens should be located in well-drained soils. They allow stormwater to be absorbed by plants and infiltrated into the groundwater. How can you apply this in your park? A simple rain garden can be located near a walkway, parking lot, court area, or other paved surface to absorb stormwater runoff. Native vegetation that thrives in wet conditions should be planted to enhance the water absorption capabilities of the rain garden. Additional benefits of native vegetation may include creating habitat areas for wildlife and birds and aesthetic enhancement of the site. This type of design is inviting to park visitors and educational signage can illustrate how a simple rain garden design can be created at home to reduce stormwater runoff. Pervious Pavement- consists of a permeable pavement (surface course) underlain by a uniformly-graded stone bed which provides temporary storage for stormwater runoff and promotes infiltration. The surface course may consist of porous asphalt, porous concrete, or various porous structural pavers laid on uncompacted soil. How can you apply this in your park? Pervious pavement can be used in parking areas, on basketball and tennis courts, for trails and walkways, etc. Use of pervious pavement is not practical for wooded or flood prone areas due to sediment and leaf-litter filling the porous voids of the pavement. In open areas, use of pervious pavement provides the added benefit of managing stormwater beneath the surface, minimizing disruption of additional areas for the management of stormwater and the costs associated with construction of a stand-alone stormwater management facility. For large parking lots consider a mix of surface types that include turf parking with a gravel base, aggregate paving for traffic aisles, and pervious paving for parking stalls. Riparian Areas- a permanent area of trees and shrubs located adjacent to streams, lakes, ponds, and wetlands. Riparian forests are the most beneficial type of buffer for they provide ecological and water quality benefits. How can you apply this in your park? Enhance the areas adjacent to rivers, streams, wetlands and ponds with native vegetation or create a “no mow zone” with meadow grasses that is at least 35’ wide on all sides. Be sure to include public access points where appropriate so park visitors can enjoy these water resources. Interpretative signs can describe the benefits of riparian areas and describe the wildlife habitat areas created. Vegetated Swale- a broad, shallow channel densely planted with a variety of trees, shrubs, and/or grasses. 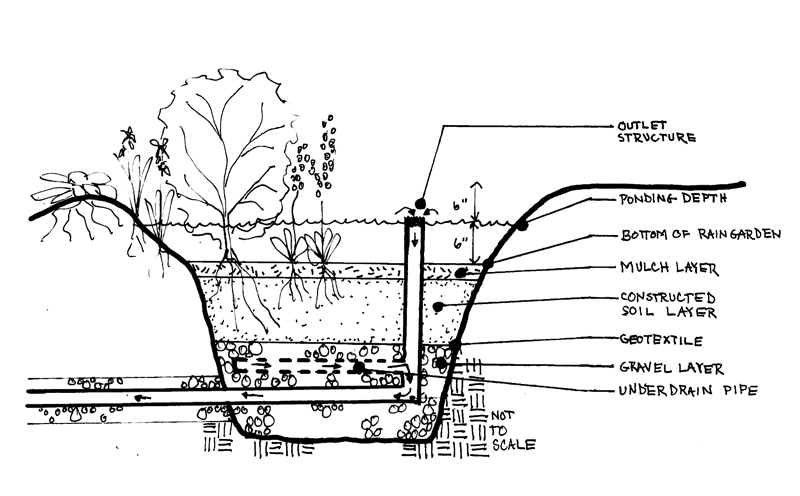 Vegetative swales should be promoted in lieu of storm piping to convey stormwater naturally, promoting infiltration, reducing runoff volume, and filtering pollutants. How can you apply this in your park? A vegetated swale is an economical alternative to storm piping and may be constructed between a street, parking lot or commercial/industrial area and the park to provide a natural stormwater infiltration area. 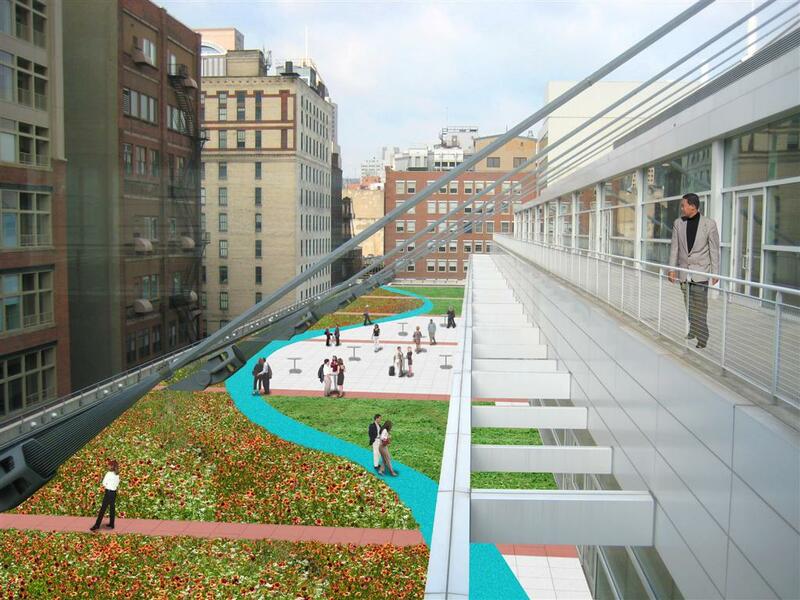 The park can become a solution to an urban stormwater issue. Naturalized Infiltration Basin- an earthen structure constructed either by impoundment of a natural depression or excavation of existing soil that provides temporary storage and infiltration of stormwater runoff. How can you apply this in your park? Existing and new stormwater management basins can be naturalized with native plantings to aid in faster infiltration and to provide wildlife habitat. Basins can be planted with native wildflowers and warm season grasses that are attractive and low maintenance. Floodplain and Wetland Restoration- tries to mimic the interaction of groundwater, stream base flow, and vegetative root systems- key components of a stream corridor under pre-settlement (pre-1600s) conditions. The interaction among these elements provides multiple benefits, including the filtering of sediments and nutrients through retention of frequent high flows on the floodplain, removal of nitrates from groundwater, reduction of peak flow rates, groundwater recharge/infiltration, reduced erosion, control non native invasive species, and an increase of storage and reduction of flood elevations during higher flows. How can you apply this in your park? Floodplains should remain natural without constructed facilities; however low-impact accessible paths may be included to invite park visitors to walk among native vegetation and view wildlife. Existing wetland should be protected and restored to enhance their ecological benefits such as increasing water quality, reducing stormwater impacts, and providing critical habitat for a variety of species. 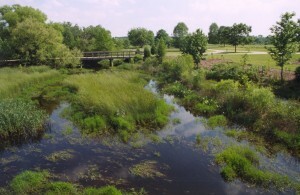 Boardwalks and viewing decks can provide access to wetland areas for environmental education. Educational signage can be installed to teach park visitors the critical role floodplains and wetlands play in the environment. Reforestation- replant the site with trees. How can you apply this in your park? Reforestation can occur in both natural areas and developed areas of a park. Riparian corridors, floodplains, wetlands, meadows, and forest edges can all benefit from reforestation. Reforestation and planting of trees near picnic areas, pavilions, spectator areas, playgrounds, benches, trails, and other built features will enhance the environment, provide shade, and create a sense of place within a park. 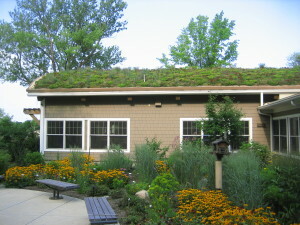 Extensive Green Roof- the most popular green roof for smaller structures and existing structures. Its lightweight attributes minimize the amount of structural changes needed to create it. How can you apply this in your park? Extensive green roofs may be constructed on park kiosks, pavilions, environmental education centers, sheds and community recreation centers. Warm Season Meadows- conversion of a turf area into a meadow. Native species should be selected for their minimum need of fertilizers, herbicides and pesticides. Minimize mowing to two times per year. How can you apply this in your park? Meadows can be integrated into most park sites; particularly along riparian corridors and, forest edges and within un-programmed open space. Meadows diversify the land cover; attract butterflies, birds, and wildlife; and reduce on-going maintenance costs associated with mowing. Trails can be created through the wildflower and/or warm season grass meadow and bluebird boxes can be put up to create wildlife viewing opportunities. Educational signage can be installed to present the environmental and ecological benefits meadows provide vs. turf. Runoff Capture and Reuse- encompasses a wide variety of water storage techniques designed to “capture” precipitation, hold it for a period of time, and reuse it. These storage techniques may include cisterns, underground tanks, above-ground vertical storage tanks, rain barrels or other systems. 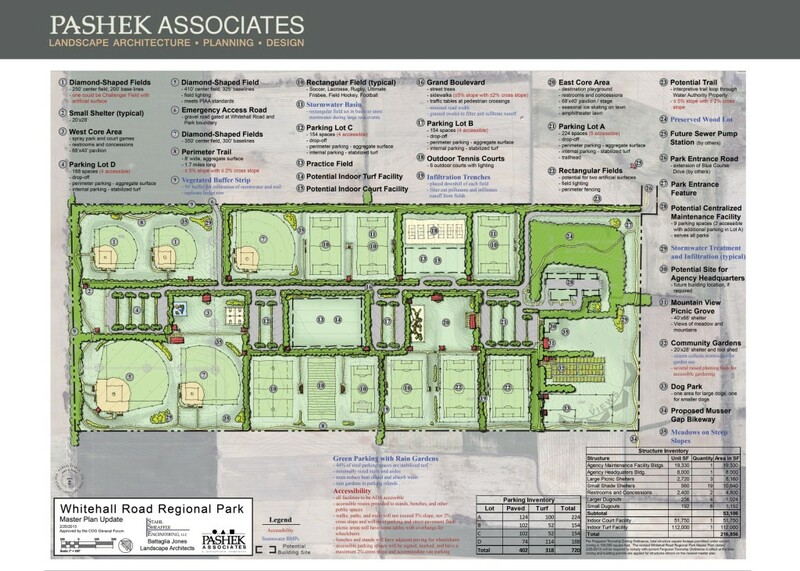 How can you apply this in your park? Rain barrels and cisterns can be used in parks to capture roof runoff from pavilions, environmental education centers or community recreation centers to then be used to irrigate gardens and water plants, flush toilets, storage for firefighting needs, etc. You can find more information about Stormwater BMPs in the PA Department of Environmental Protection Stormwater BMP Manual here. Irrigation – We watered periodically during the first growing season to get the plants established. We did use a drip irrigation system during that period which made it a little easier. Since then, we have removed the drip irrigation and haven’t watered anything, except once or twice when one of the staff has recognized that it hadn’t rained in several weeks. We recommend sticking to a strict watering schedule in which the plants are watered thoroughly every few days for the first week or two, and then once a week for the first growing season. Long, deep watering encourages deeper rooting and stronger, healthier plants. If the water just reaches the surface, so will the roots, which prevents the plants from gathering more water during droughts. 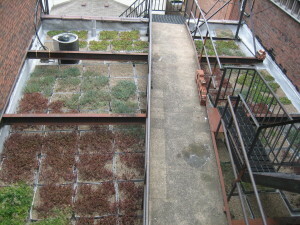 Maintenance – During the first and second growing seasons, we weeded the green roof several times a year. Since then, we have weeded once or twice a growing season. Typically, an employee will take a break from their daily grind to spend five or ten minutes on a beautiful day weeding. Plant Selection – All of the sedum have been doing well except Sedum spurium ‘Red Carpet’ which seems to get scale. We recommend mixing a large variety of species in order get a higher survival rate and ensure that a disease won’t wipe out an entire area. 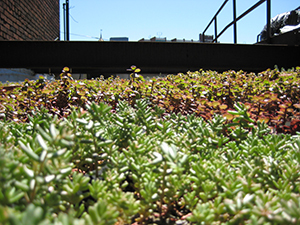 Sedums work well with shallow soils such as on our roof. However, most are non-native. If you want more native plants, six inches or more of growing medium is best. 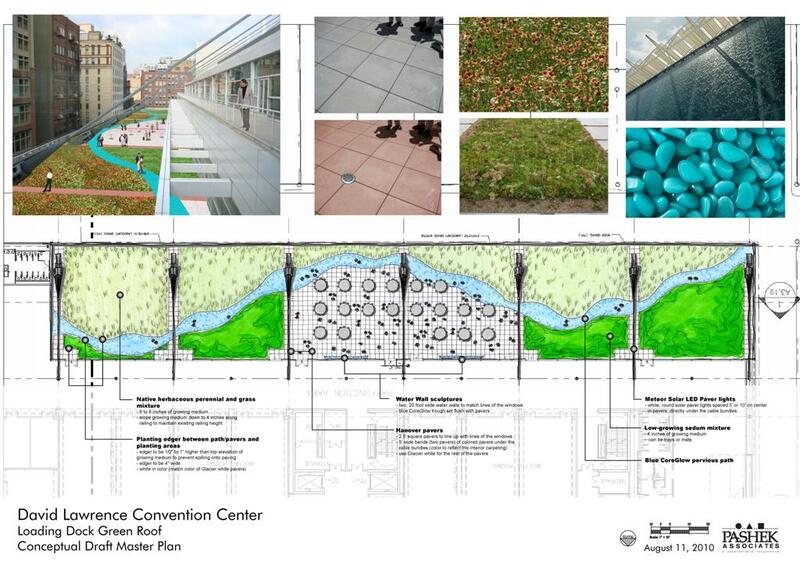 Environmental Benefits – Our green roof retains up to 95 gallons of water during a rain storm. That’s up to 95 gallons of rain water that doesn’t flow directly into the Combined Sewer system and into the Rivers. It is also providing some refuge for several species of bugs. 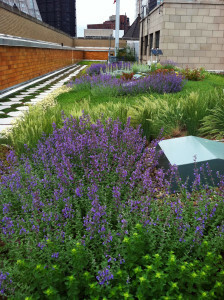 We haven’t measured the air quality, but know that our green roof is producing more oxygen and absorbing air pollutants. 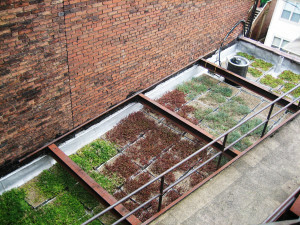 Cost Benefits – We are in the process of figuring out how much energy we save due to the green roof. We already know that it is protecting the rubber membrane underneath from harmful UV rays and therefore extending its normal life span. Final Thoughts – If you are part of a small office building with just a few employees, constructing a green roof is possible with just a little bit of effort and money. Sedums are the easiest to maintain. Creating a maintenance schedule for the first two growing seasons will help ensure that your investment does not die. Our office has a dishwasher and trash duty schedule in which each employee is responsible for about one month out of the year. This can be adapted to a green roof maintenance schedule. If you really want to know all of the specific benefits your green roof will have, try installing monitoring equipment or just look at your utility bills. Finally, we couldn’t tell everyone that they should put green roofs on their buildings unless we also encourage them to first consult a structural engineer to determine if a green roof is feasible. When you think of infrastructure, you usually think of things like roads, sewer systems, water supply, power grids, etc… It is the basic physical structures needed for a community to enable, sustain, or enhance a certain standard of living for its residents. It enables the buying and selling of goods and services at a more efficient level. Could you imagine your workplace without internet, electricity, or even roads connecting you to your clients? Wetlands and riparian buffers are green infrastructure. But what does it mean when “green” is placed in front of the word infrastructure? Green Infrastructure is a concept that can, and should, be applied to all different scales of planning and design. Basically, it includes everything from strategically planned and managed networks of natural lands, to working landscapes, to recreational landscapes, and other open spaces that conserve ecosystem values and functions. In other words, greenways, parks, riparian buffers, wetlands, floodplains, rivers, and even stormwater Best Management Practices such as rain gardens, porous pavements, green roofs, and trees are all part of Green Infrastructure. It recognizes the importance of natural systems and processes within our communities. 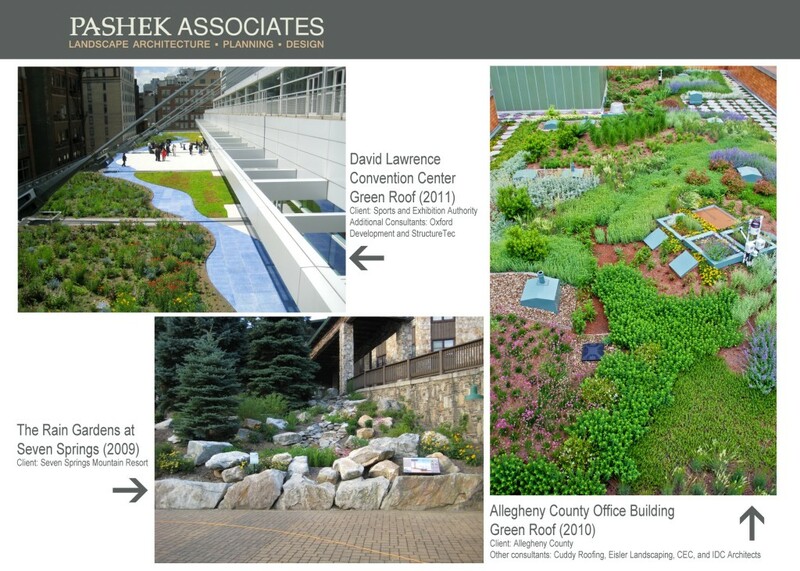 Green roofs and rain gardens are green infrastructure. Why has Green Infrastructure become so important in the last 10 or 20 years? Well, because it is beneficial for the environment, human health, the economy, and our society as a whole. Working with and using natural processes ensures that we’ll have resources for future generations. Stormwater BMPs reduce flooding, pollution, and the strain on our storm sewers. Street trees beautify our neighborhoods, increase property values, reduce the urban heat island, and absorb air pollution and stormwater. Greenways help protect steep hillsides from being developed and eroded, protect wildlife habitat, and offer recreational opportunities. Constructed wetlands not only provide wildlife habitat but filter pollution and even human waste. So the next time you step outside, try to identify what types of green infrastructure are present and how they help to make your community a better place. 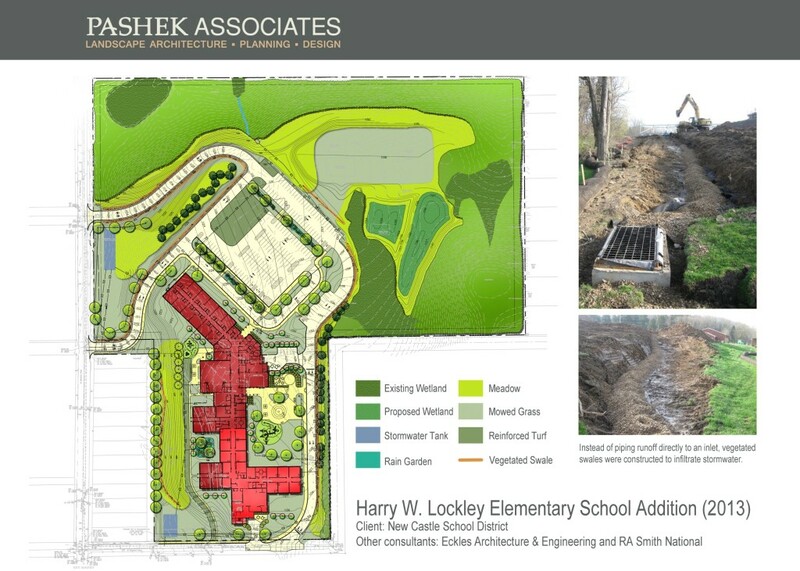 In 2006, Pashek Associates decided to experiment with designing and building a green roof on our 1890’s office building located at 619 East Ohio Street on the Northside. We wanted to see what we could do with a little money, a little time, and a little physical labor. After discussing different options, we decided on a simple extensive tray system, mostly because the manufacturer was using them on a larger project in the city and agreed to put an extra one hundred trays on the truck and deliver them at a discounted price. One cold December morning, we put on our working gloves and carried the 50-pound trays filled with special growing medium into place, assembly line style. 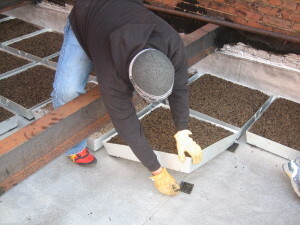 Each 2’x2’ aluminum tray was set down on five small rubber pads to allow excess roof runoff to flow under the trays and into the existing roof drain. 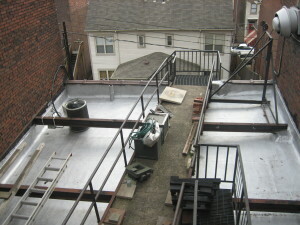 No other material was applied directly to the roof. It was as simple as that! Then, on a warm spring day, the whole office pulled our gloves back on and planted the trays with several varieties of sedum. We used small plugs and get them a good soak using water from a rain barrel attached to our third floor roof. We did install a drip irrigation system for the first growing season. We have removed the system and haven’t needed to water the plants since. A couple years later, we thought we had a roof leak. A roofing contractor moved the trays around the roof in order to find the leak. 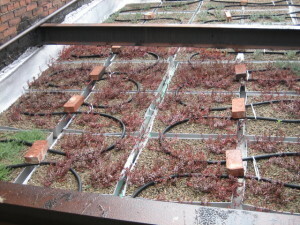 He was surprised to find that there was almost no degradation of the roof membrane as a result of the green roof trays. Ultimately, instead of finding a leak in the roof, the contractor found a leak in a brick wall. 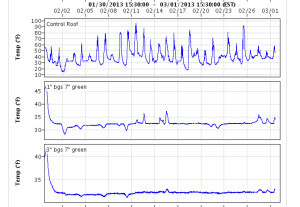 That’s when we knew that our green roof was really doing it’s job!